My book creation combines two of my passions - paper crafting and children's literature. I am a first grade teacher and my students were more than willing to help with the project. They shared some of their favorite books and book series, and now I will pass them along to you. I created a small scrapbook using my new Your Story. This is my sweet friend and teacher-neighbor, Kim on the right, and me on the left. We are Thing 1 and Thing 2 from Dr. Seuss' "Cat and the Hat." Blog Candy!!! For a chance to win the DCWV small stack, Grade School, some school-themed embellishments, and a small pack of clear stamps, leave a comment on this post. I will choose a winner this Friday, March 4th. Please join me as a follower. Thanks for stopping by! Becky - http://www.cricutinmyclassroom.blogspot.com/ You are here! i love it! what a great way to show off your class! tfs! This is adorable. I wish I had more photos of my kids reading. One of my favorites is when my husband went to Donuts for dads with my son, and they read a book together. Love that photo. Great idea for a book. Thanks for sharing. This is so adorable! I love all of the cricut images! You are perfect for this project, being a 1st grade teacher! And it shows by your work! I am a new follower. Love your book. Thanks for the chance to win some Candy, I could use those, my son is graduating from Kindergarden soon, I can see me using them for some LO's for him, and also a few cards. :) TFS. Really cute book! I am a new follower, Thanks for the chance to win! Going to look at your other projects now! Super cute. I love how you put it together. I am a new follower of your blog! Sweet Book, I love making these as gifts every year for my daughter's teacher. TFS! What a great book! You are sure to treasure it always, I love that the kids love to read and create! Oh wow what a great book....Love it. You are absolutely amazing!! God has given you such wonderful gifts to inspire not only little people with your classroom teaching, but also big people with your awesome craft projects! Your book is wonderful and I'm sure your class will really enjoy it! What a wonderful book! I love how you added the pictures of the kids holding their favorite books! The picture of you at the end is cute too! My SIL is a 3rd grade teacher and she left this morning wearing a Cat in the Hat, hat. The head master of her school bought all the teachers one to wear, today. She looked so cute! Very excited that I came across your blog! I love your book! What an amazing idea Becky! I love this. If I were going to teach school, I think 1st grade would be my choice. They are so thirsty to learn at that age and just beginning reading most of them. I truly believe the love of reading is one of the most important things you can teach a child :) I am a new follower of your lovely blog. This is adorable. Thanks for sharing a great book idea. Such a cute book! I love the idea of using the kids ideas. I bet your students think you are THE BEST teacher ever letting them create in your classroom. Fabulous book! I am now a follower of your blog - so very nice to meet you. What a great idea to get your students involved. My kids always love the crafts that they get to do a school. I have a 2nd grader and he loves to help me play with my Cricut. Glad I came across your blog! I am a new follower of your blog (nice blog design). Your book is cute and nice that you involved your students. TFS. 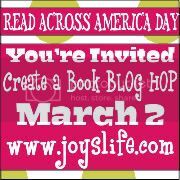 I would love it if you hopped over to my blog and became a follower. Awesome book. Thanks for sharing. Love your book and for sharing some of your classroom fun. What a great idea to include your students. I'm sure they loved the finished product! I think it's great that you got your students involved in this. Books are so important and I love your book. Thank you for sharing. Being a K/1 special education teacher, I have to say your book inspired me to do something along the same lines. Adorable book. Your students are lucky to have you for a teacher. I am a new follower. Great book. How cool that your students helped. What a cute idea! Love your blog! Thanks for the ideas! Great idea! I am a new follower. I am so glad I found your blog through this hop. I am a teacher, too! I'm going to have to make my daughter a first grade book! I love this! I LOVE your book idea! I teach PreK and we make picture books (using the kids'photos) all the time. They really enjoy looking at themselves, so I plan to make your book soon and let them hold their favorite book! Thanks for the great idea! Cute book!! Love the thing one and thing 2 pic! priceless! I don't have Your Story and you are showing it off just great! Love it. Love the mini album you did. That's cute and what a great thing for parents to look through when they visit or while waiting for a conference. This gives me idea's to use my yourstory for! What a cute book Becky!! I love how you shared all the favorites of your class. TFS!! And thank you for being a teacher!! Your book is very cute. You must be a wonderful teacher. How lucky kids are to have one so talented. Thanks for sharing. I am a new follower to your blog! Thank you for the inspiration, I have a 8 year and a 6 month old grandson andyou have given me an idea, thanks for that and for the great chance at your giveaway! Becky, I love your book, oh the memories......LOL some I read, some I read to my son....all great books.....TFS!!! This is so adorable! I love Curious George...I bet it is so much fun to teach and be such a positive influence in these children's lives. Thank you for sharing this with us! What a great idea for a gift to my children's teachers. Super cute idea. We love many of those books as well. TFS New follower here. This book is so cute! I love all the colors. Sweet idea and looks like everyone had fun. Thank You for sharing in the hop.